Viewing topic "Upgrading from XS!" You guys have any information if Yamaha will come out at the winter namm show this year, 2019, with a new keyboard, like montage1 or even a different keyboard name? I whould like to upgrade from motif xs to montage but if they comming out with a new board I will preffer to wait a littlebit! Thanks, have a blessed evening! The MODX is all the rage at the moment. It’s very similar to montage but a lot cheaper. 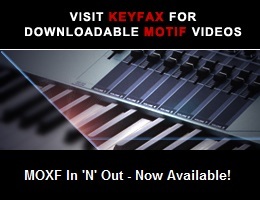 You get most of what Montage offers along with Motif sounds compatibility (and DX7 sounds compatibility) all in a lighter case with a few other bells and whistles missing, not that you would really miss them for the most part! As you should know by now, Yamaha did announce some CPs. Which are quite nice btw. But they are not an upgrade of a Motif XS. Neither is a Montage or MoDX. If It were me at this point, I would wait until 2020. That would be I think the 20th Anniversary of the Motif. Maybe Yamaha will have an Anniversary Special Edition of the Motif to commemorate the 20th anniversary of one of the most successful synthesizer workstations ever sold. In either event, Yamaha is basically recommending Cubase to Montage/MoDX users to make the instruments complete, all you need to do is add Cubase to your XS setup (if you haven’t already done so) and add FM synthesizers to you Motif XS via VSTs and Cubase.